Yoga Practice at RISE Prime Wellness. RISE Prime Wellness yoga is the first of its kind. Medically managed by a Doctor of Physical Therapy, RPW yoga classes are small group classes. Unlike other studios, we cap our classes at 10 people. We believe that people move the best in a small guided setting. 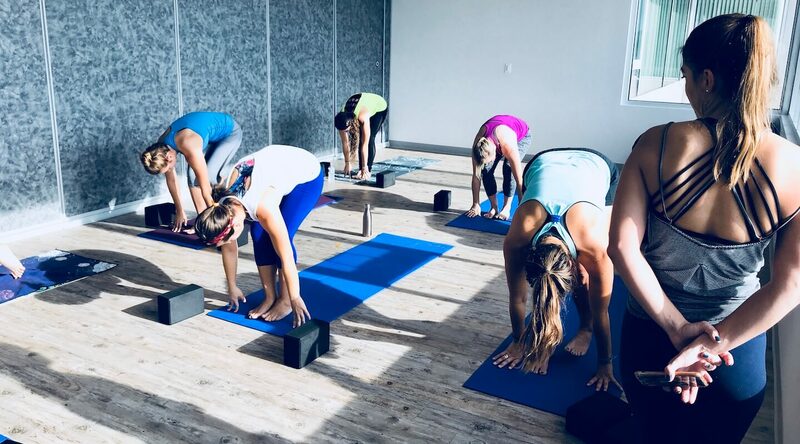 With small class sizes, our trained yoga instructors have more time to oversee their class attendees for a more safe and functional practice. With functional movement and mobility in mind, our yoga instructors have been trained to update your yoga practice with the understanding of human anatomy and functional needs. You will be introduced to dynamic stretching, functional balance training, and strengthening poses that will help you on and off the mat. All classes are available to all levels of students. Each class offers a variety of options for each pose and transition so that you can adjust your yoga class to your skill set and needs. For further information about each class style, please see our class description page. We look forward to seeing you on the mat! Rise Vinyasa offers energetic sequences with fluid transitions and opportunities for advancing your practice. While maintaining a foundation that is accessible to all-levels, you will learn unique variations to postures, proper alignment techniques, and grow stronger and leaner. RISE Power is an all-levels call that aims to challenge your practice by building internal heat, utilizing heating breath, and offering opportunities for advanced postures. With focus on core activation and building strength, you can expect a dynamic sequence that will challenge you to the next level. Hatha is a gentle and basic yoga class with no flow between poses, which helps bring peace to the mind and body. Expect a slower-paced, stretching-focused class with some basic pranayama breathing exercises. Hatha classes are a good place to work on your alignment, learn relaxation techniques, and become comfortable with doing yoga while building strength and flexibility. Rise Dynamic is a restorative, skillful class developed by a doctor of Physical Therapy and aimed towards safely realigning joints, opening fascia, and recovering muscle damage. This class will counter active lifestyles and guide you to a healthy foundation for your body to operate to at its peak capacity. Rise Flow is an all-levels class promoting continuous movement and a connection to breath. Embodying a breath-to-movement pattern in every class, we will heat up internally, fire up the limbs, and then stretch it out releasing tension and stiffness as the class winds down. Perfect for building strength and flexibility! Sculpt Yoga is an all-levels class that aims to challenge your practice by building internal heat, utilizing heating breath, and offering opportunities for advanced postures. With focus on core activation and building strength, you can expect a dynamic sequence that will challenge you to the next level.